Paccar Inc. reported a 35% jump in net income plus higher revenue for the third quarter as truck deliveries and aftermarket sales drove the results. The gains came as the truck maker forecast higher capital investments and research and development in 2019 in preparation for tackling new powertrains, truck models and facilities. Net income for the period ended Sept. 30 climbed to $545.3 million, or $1.55 per diluted share, compared with $402.7 million, or $1.14 earned in the same period last year. Revenue was $5.76 billion, 14% higher than the $5.06 billion a year earlier. The results benefited from one-time tax items, offset by lower truck margins due to the normal factory summer shutdown at its European subsidiary, DAF Trucks, and costs associated with supplier parts shortages in North America, according to the Bellevue, Wash.-based company. It is the parent, too, of Kenworth Truck Co. and Peterbilt Motors Co., its North American brands. 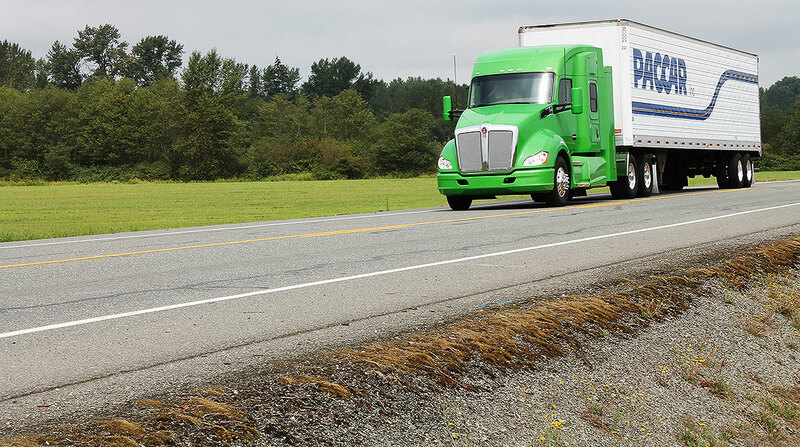 Paccar delivered 47,800 trucks during the third quarter, 3% more than the second quarter. Of those, 28,400 were in the United States and Canada, a 22% increase compared with 23,300 a year earlier. Paccar forecast Class 8 truck industry retail sales for the United States and Canada are expected to be 280,000 to 290,000 vehicles in 2018, 31% higher than in 2017. Class 8 truck industry retail sales in 2019 for the United States and Canada are estimated to be 280,000 to 310,000 vehicles, which would be one of the strongest markets in history. At the same time, Paccar Parts posted a pre-tax profit of $188.5 million in the third quarter, 24% greater than the $151.8 million a year earlier. Third-quarter revenue in the parts division hit $960.1 million, 14% higher than the $840 million achieved in the third quarter last year. “Paccar Parts’ outstanding sales and profit growth have been driven by investments in new parts distribution centers, innovative programs such as national fleet services and Paccar Genuine and TRP all-makes parts” and a larger percentage of Paccar MX engines needing aftermarket parts, said David Danforth, Paccar vice president and Paccar Parts general manager. Meanwhile, Paccar has invested $6.1 billion in new and expanded facilities, products and technologies during the past decade — and more spending is on tap. Capital investments are estimated to be $425 million to $475 million, and R&D expenses are expected to be $300 million to $310 million this year. That compares with its estimates of $525 million to $575 million in capital projects and $300 million to $330 million in R&D expenses in 2019. “The company is investing in new truck models, integrated powertrains including diesel, electric, hybrid and hydrogen fuel cell technologies, aerodynamic truck designs, advanced driver assistance systems, enhanced manufacturing and parts distribution facilities and innovative aftermarket support programs,” Paccar Chief Financial Officer Harrie Schippers said. Among the quarterly highlights Paccar singled out were DAF showcasing its CF Electric and LF Electric heavy- and medium-duty urban distribution vehicles at the IAA Commercial Vehicles show in Hanover, Germany, in September. DAF also presented its CF Hybrid vehicle with the MX-11 engine that delivers zero emissions in urban areas. Paccar in 2010 launched its MX engine in North America after having developed and manufactured a similar engine used in its DAF trucks at the time. Also, Paccar pointed to the debut of Kenworth’s W990, its new conventional truck intended for over-the-road and vocational applications. • Truck backlogs are strong, with production schedules reaching into the second half of 2019 for North America. • There was a 3% price increase in the quarter to offset a rise in the cost of labor and materials. • Recent tariffs on Chinese goods will have an effect of hundreds of dollars per truck.